For a quality that you won't find anywhere else, take a look at Hansgrohe's amazing Rough 4 Hole Tub Filler, Hansgrohe model # 06646000. This durable unit provides all the functionality you could need in a rough tub filler at a price that anyone can easily afford. The Hansgrohe Rough 4 Hole Tub Filler delivers 90 degree ceramic valving set, which is capable of delivering water at a powerful flow rate of up to 10 gallons per minute at 44 PSI. 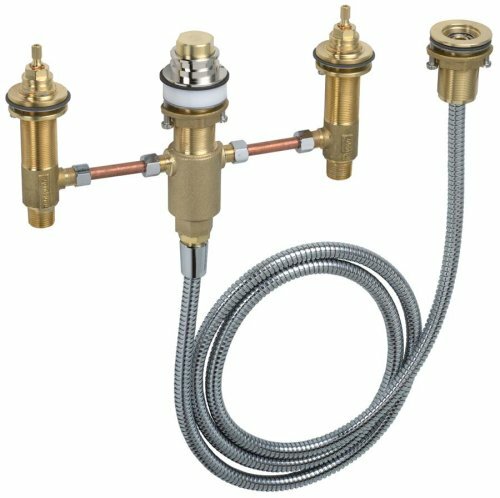 With 1/2 inch connections, the Rough 4 Hole Tub Filler includes an 80 inch hose and fast, easy installation. I do not have any complaints with the valves. The plumber also did not have any problem during installation. If ever something goes wrong, I will definitely provide an update. Otherwise, I am very satisfied with this because it is relatively cheaper compared to the same thing available in physical stores. This whirlpool tub faucet was installed by our contractor. I think this is good quality because it is heavy on the hands.